A view of the Statue of Unity during sunset, at Kevadiya colony in Narmada district of Gujarat, Wednesday, Oct. 31, 2018. The Centre splurged more than Rs 2.64 crore on advertising in the media for the inaugural of Sardar Vallabhbhai Patel's statue, known as the Statue of Unity, a RTI reply revealed here on Wednesday. Prime Minister Narendra Modi had inaugurated what is now the world's tallest statue on October 31, 2018, to mark the 143rd birth anniversary of Patel, a freedom fighter and the first Home Minister of Independent India. Mumbai Right to Information (RTI) activist Jatin Desai had written to the Ministry of Information and Broadcasting seeking details under RTI of the expenditure incurred on advertising the statue inauguration in different media. The Bureau of Outreach and Communications of the Ministry said in a reply on January 9 that the government had spent a total of Rs 2,62,48,463 on the electronic media and another Rs 168,415 on print media advertisements. "This amount does not include the total spent by the government on the inauguration, plus on outdoor advertising which is not available with the Bureau. Spending such a huge amount on advertising and lavish ceremonies cannot be justified when the people in the vicinity of the statue are tribals and poor," Desai said. 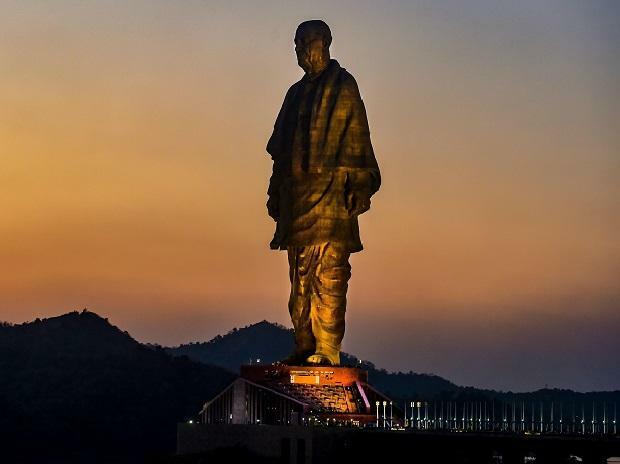 The colossal 182 metre-tall statue of Sardar Patel is situated on an island on the Narmada river near Kevadia, around 100 km south-east of Vadodara city of Gujarat. Built at a cost of nearly Rs 3,000 crore, the landmark statue was designed by sculptor Ram V. Sutar, 94, of Maharashtra and built by Mumbai-based Larsen & Toubro company.